I was really wanting to make a pot of Navy Bean Soup with Cabbage using the ham bone that I have in my freezer from Christmas, only I was having trouble finding the recipe that I used when I made it once before. I thought for sure that I'd find the recipe and had Joe pick up a head of cabbage a couple weeks ago, but I didn't have any luck and decided to just try something different. While I originally wanted to use dry navy beans, I found a quicker cooking recipe using canned white beans. So using my last can of cannellini beans, the last of the diced ham (the ham bone is still in the freezer) and 1/2 of the head of cabbage, I threw together this wonderful pot of soup. Cook potatoes for a minute or two in the hot oil over medium heat, until edges turn golden and they become slightly tender. Stir in the carrots, onions and garlic. Allow to cook for a few minutes, stirring occasionally. Toss in the bouillon cubes, cook for another minute. Stir in the water, season with pepper. Stir in the beans and bring to a simmer. Add the cabbage and allow to cook until tender. We really enjoyed this soup a lot and could have easily finished the entire pot in one night between the two of us, but we showed restraint and now have enough for another dinner. 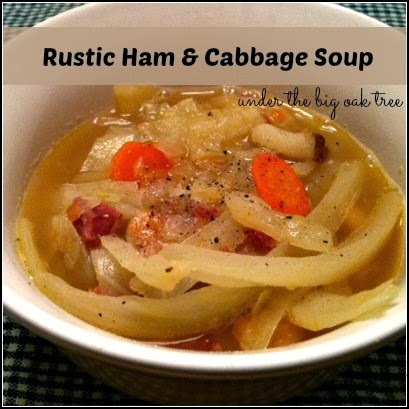 This could easily be adapted for an entirely vegetarian meal by omitting the ham and using a vegetable stock, as written in the the original recipe linked above.